Three months and an aggressive blood disorder are all that took to rob two-year-old Mahin of the promise of childhood, leaving him racing against time for survival. Diagnosed with a rare blood disorder, Mahin's only hope is a bone marrow transplant thanks to an HLA match with his four-year-old sister. His parents Ashok and Gayathri, along with their friends and family, come from low-income households and are fighting alongside Mahin to gather funds for the surgery. Mahin's condition is getting worse, and his eligibility for BMT is entirely time dependent. He is on a clock and requires the surgery as soon as possible to have a shot at the life every child is promised. Just until August 2016, Mahin Reddy was like any other toddler in the all too familiar yet adorable phase of terrible twos. When he began to show skin rashes, his parents, Ashok and Gayathri, rushed him to the doctor hoping for a minor diagnosis. In a few days, his condition further deteriorated, and after multiple consults back in Hanumenahalli and in Bangalore, little Mahin was diagnosed with a rare condition of aplastic anemia, coupled with neutropenia, a condition that makes him extremely vulnerable to infections. "We thought it was dengue or some other fever. He was so full of life, and the minute the disorder showed signs, he completely retreated into himself. He is extremely dull. I don't think he knows what is happening to him or around him, and that is probably the worst part." The medical terminology shook Ashok, a 10th standard graduate who has spent the last 18 years of his life cleaning in the restaurant kitchens in the city, struggling from the pain of being separated from his family to make ends meet. Today his salary is Rs. 9,500 per month with deductions if he takes even a single personal day. He is the sole breadwinner for the household, with his wife pursuing her education, and his ailing father requiring assistance to milk money out of the lone cow in their family shed. The medical bills have piled on since August 2016 pushing Ashok and Gayathri to leverage all they own including wedding jewels, an acre ancestral agricultural land and all their life's savings. The employees at the restaurant pooled their funds and raised Rs. 50,000 to help Mahin get the best help they could afford. The family now has Rs. 20,000 on hand for their future expenses having paid off Rs. 1,20,000 for emergency care and diagnosis across various medical centers. Luckily, Mahin's sister is an HLA match, and he is eligible for a BMT estimated at a cost of Rs. 15,00,000. His condition is critical as he needs to be in a sterile environment to avoid complications from any infection. The family is now living in a room close to the hospital, paying Rs.600 per day for boarding in addition to expenses for food, travel and frequent transfusions for Mahin. "We cannot even move to a different place to reduce our expense. The last time we stepped out with Mahin just for a little while we ended up in the hospital for more rounds of platelet transfusion. Each time it costs about Rs. 5,000 to Rs. 7,000, and we are completely running out of money. I am going to work hoping we have at least a little income, even though the doctors have advised me to stay close as every second is critical." Ashok has recently seen and stood by his friend's child succumb to a similar medical condition. He is working hard to earn what little he can to contribute towards Mahin's surgery and save his little boy. "They said it is time-sensitive. If any changes occur in his or my daughter's medical profile, we would lose the chance to save him. We cannot lose our little boy. He is just two years old." Your contribution can help Mahin get the help he needs as soon as he can so he can have a real chance at life. Thank you all for coming forward to help Sidamma. 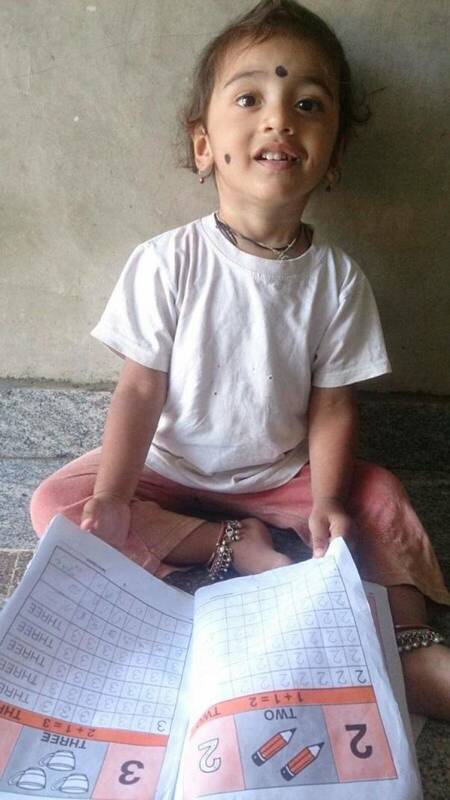 Your contribution has helped this little girl to finally get the treatment. The slow recovery of the child has been a real worry for her parents. The low WBC count has affected her immune system and her hair and eyelashes have started to slowly turn white. However, finally with your support and contribution, she will be undergoing Bone Marrow Transplant (BMT) which is expected to begin on 19th January 2017. Her parents are happy and thanked each and every supporter without whom this would not have been possible. 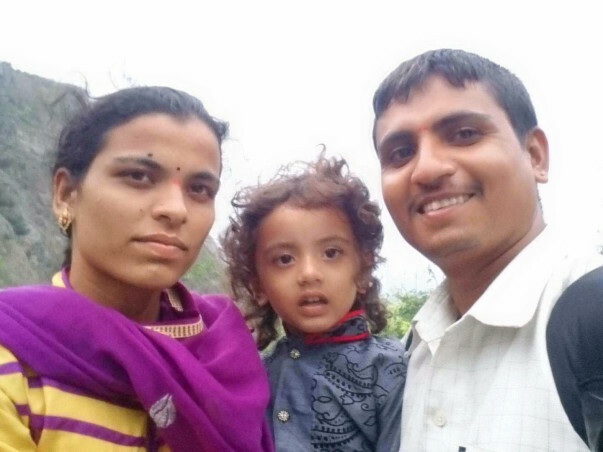 Mahin’s parents Ashok and Gayatri are very thankful to all the donors for their support. The family does not require any funds for Mahin’s treatment. 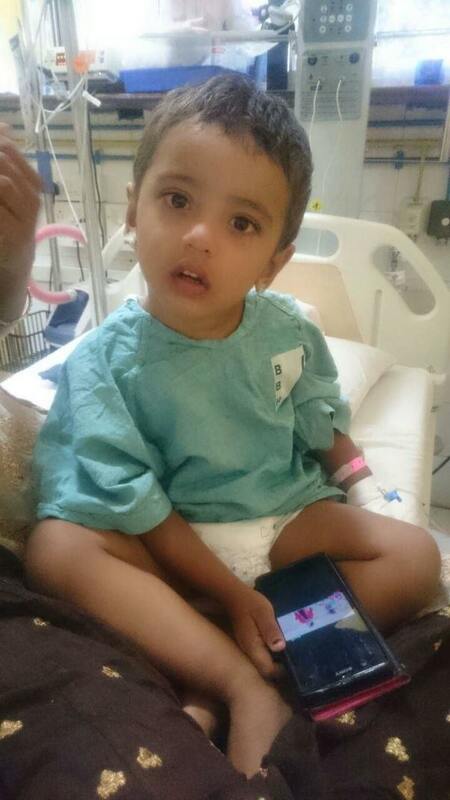 The child is recovering well and his parents are relieved. They are thankful to all of us and God for getting them through this tough time. Siddama’s parents have managed to raise Rs. 71,867 for her treatment. Sanekappa (Sidamma’s father) is now seeking your help so that Siddamma can undergo the treatment as planned. The funds will be transferred for Sidamma’s treatment as her total white blood cell count has drastically fallen in the last one week. 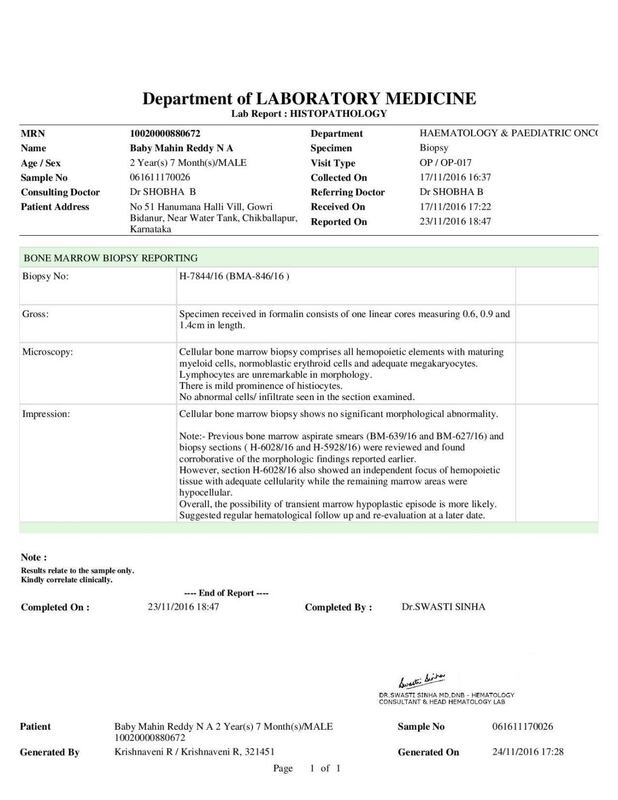 Mahin Reddy was presented with echymosis and pallor. He received one packed cell unit and 3 platelets transfusion. Bone marrow aspiration and biopsy was suggestive of aplastic anaemia. As he presented with severe anaemia, neutropenia and thrombocytopenia requiring transfusions, he was considered for treatment for aplastic anaemia. He had a fully HLA matched sister. 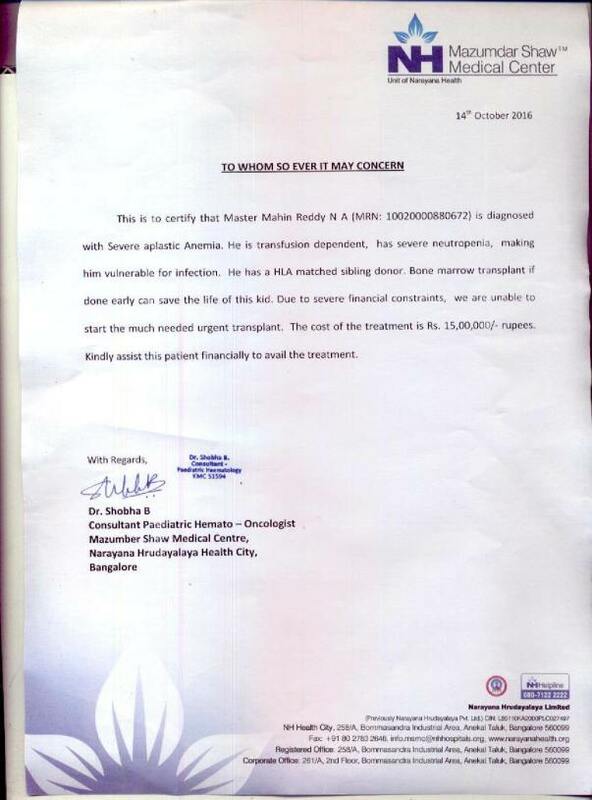 Hence bone marrow transplant was considered as the treatment of choice. Meanwhile, he was kept under observation with weekly blood tests to assess the need for symptomatic treatment. His counts started showing improvement in the last 15 days spontaneously. The last CBC done on 17-11-2016 was normal. Bone marrow aspiration and biopsy was done to confirm recovery. The report is suggestive of complete recovery. Hence the parents were conveyed the good news of spontaneous recovery and treatment with bone marrow transplant was cancelled. Aplastic anaemia may be caused by a congenital defect in the marrow or by acquired problems like viral infections. While the congenital aplastic anaemias need definitive treatment, viral infection induced apalstic anaemias may show spontaneous recovery over a period of few months. Fortunately, Mahin Reddy showed spontaneous recovery suggesting the possibility of viral infection induced aplastic anaemia. However, he will be on monthly follow up to evaluate for recurrence or progression to any other disease and will be updated accordingly. The latest reports are attached below. I thank all the donors for the overwhelming response to help Mahin Reddy financially. I request all the donors to bless this child and wish him good health. May he remain in complete recovery and not need the assistance any more. God bless him. Get well soon.